Dept. 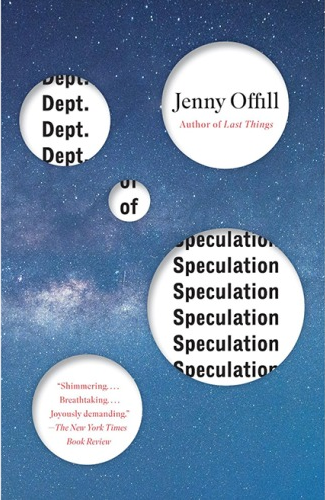 of Speculation first caught my eye when The New York Times Book Review called it one of the top 10 books of 2014, but it wasn’t until I read more about it in The Morning News‘ Tournament of Books that I really felt compelled to read it. It was eliminated in the first round (unfortunately by a book I didn’t like), but I was thoroughly intrigued. Dept. of Speculation takes place in the uneasy mind of an unnamed woman–known most descriptively as the Wife. She’s had a difficult relationship with her own mind her whole life. First, she pursues a career as an ‘Art Monster,’ one of those creative types who devotes their entire life to creating art, with no room at all for love or relationships. And yet she eventually finds herself not only getting married but becoming a mother. In some ways it seems to be a natural turn of events, but it’s also something of a last ditch attempt to fix herself. She believed that falling in love and becoming a mother would put her at peace with her own mind, and for a time it does. In short bursts, Offill takes the narrative through the Wife’s mind and through a series of quotes pertaining to life, literature, philosophy, and space. By all rights that should make this exceptionally brief novel a muddle, yet somehow Offill uses these bursts to deepen the mystery. The fractured structure puts you directly inside the Wife’s mind, which is an unsettling place to be at times. It’s a structure unlike any other novel I can recall, and Offill makes it work so well you begin to wonder why it isn’t more common (the answer, of course, is that Offill is making it look easy when in actuality such a structure is incredibly difficult to pull off). As the story progresses, you begin to get unsettled, gulping in the pages like an addict. And then before you know it, it’s over. I usually stop to take notes while reading, but in this case I left my pen unattended so I could tear through the pages. Offill’s writing is so full of neat turns of phrase and odd beauty that I fully intend to go back through with my pen this time to copy some of them down. I cannot think of any higher praise for a novel than that.